NEW article by Sibel Kusimba in Economic Anthropology 5(2). Special Issue Theme: Finance, 10 May 2018 for her IMTFI-funded project, Group versus Individual Strategies: Dynamic Social Networks of Mobile Money among Unbanked Women in Western Kenya. This article examines the role of gender in the use of digital finance in Kenya, including the well‐known case of mobile money but also the emerging use of smartphone apps, payment tills, digital credit services, and digital fund‐raising computer programs. Development professionals have explicitly feminist goals in bringing digital finance to women in the Global South. In several recent reports, they outline the belief that gender norms are a barrier to women's use of finance. They hope digital finance will bring women agency and control over money and consequently shift restrictive gender norms. This article offers a critique of these assumptions based on ethnographic conversations, a diary exercise, and network self‐portraiture conducted in Kenya in 2016 among both rural farmers and urbanites. Adopting a distributed agency perspective, the ethnographic study demonstrates that Kenyan women and men use digital finance not to seek individual control of their money but to produce themselves as connected and trustworthy members of financial groups and collectivities. Gender norms may not hinder women from finance but rather enhance and deepen women's and men's financial relationships and bring women success in amassing funds. Fig. 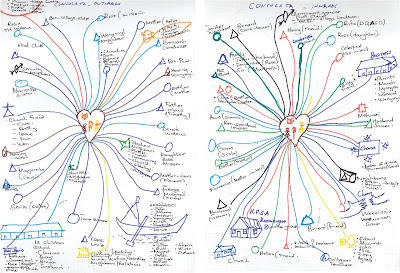 1: Consolata, headmistress of a school in rural Western Kenya, draws her social/financial networks. Through reports, studies, and research evidence, development professionals are articulating a new project to bring digital finance to women in the Global South—especially poor and rural unbanked women. They are using data sets of bank account ownership and studies of household economics, including women's bargaining power with husbands (Agarwal 1997), to claim that social and gender norms are barriers to women's agency with money (CGAP 2017a, 2017b). Development thinkers hope that digital finance on mobile phones will “rapidly connect women to digital financial services that enable them to more easily store, transfer, secure and build value digitally, beyond money payment transfers” and that digital finance will bring “empowerment and equitable decision‐making in households” (Gates Foundation 2015, 2; see also Innovations for Poverty Action 2017). How fitting are development understandings around finance, technology, and gender for Kenyan women? This article defines finance as relations between people, money, and time that are “grounded in practices of everyday life” (van der Zwan 2014, 102). In Kenya, financialization—as I define it, the increasing use of everyday finance—often relies on digital channels and has emerged as a meld of formal (provider‐designed) and informal (user‐innovated) sources. Formal products designed for the low‐income and unbanked include digital credit via mobile phones. Informal user innovations with apps and services are equally if not more common, such as WhatsApp fund‐raising and money pooling and circulation through M‐Pesa, a money transfer service. In this article, I describe the cultural practices and meanings around gender that influence people's engagement with digital finance. I question the idea that the value of digital finance for Kenyan women is resistance to social and gender norms. My critique centers on the idea of agency. For the development professionals of the IPA webinar, agency is a quality of individuals. It is a noun, “something one has” or does not have (Gero 2000, 34), and from a liberal feminist perspective, it implies autonomy, emancipation, and resistance to social norms (Mahmood 2001). Rather, I suggest that the agency of Kenyan women is profitably viewed as a way of acting and being in particular settings—as “the condition and constraints under which we pursue our goals” (Enfield 2017, 3). This broader view draws attention to agency as joint action in groups, as distributed through relationships between people and material systems (Burrell 2016; Enfield 2017; Pettit and Schweikard 2006).